One factor of America's extraordinarily high medical costs is our belief that dying is optional. Your death is inevitable, of course, but mine is not. I and those I love simply don't have to die. I'm being sarcastic, of course, but there is not a reader who doesn't get what I mean. The dramatic change in the causes of death by Dr. Stephen Schempff describes how the advances of science and the art of healing during the last century have changed how we view death. Most of us will not have the opportunity to just die of "old age" or to simply fall to sleep one night never to wake again. Most often, we develop an illness which causes our death. These have changed markedly over the years. For the pioneers, accidents, infections, childbirth were times and causes of great likelihood of death. A century ago, infections were the leading causes of death. Today, we will probably survive much longer than our ancestors but it is more likely we will die of heart disease, cancer or stroke. This is a dramatic change in the causes of death that has occurred over the years and with it is an equally dramatic change in the factors that predispose to those deaths. In 1812 the city of Boston recorded 992 deaths of which the greatest number by far were due to "consumption." Various other fevers combined were the next most common. Cancer killed five and sudden death (heart attacks?) took 25. As our population rapidly ages there will be increasing numbers of the chronic diseases that come with aging such as visual and hearing dysfunction, mobility problems, arthritis and Alzheimer's. And as society persists in eating a non-nutritious diet and too much of it, avoiding exercise, having chronic stress and (20%) smoking there will be literal epidemics of obesity, hypertension, coronary artery disease, stroke, chronic lung and kidney disease and cancer. Just as sanitation and vaccines made a huge impact on the diseases of a century ago, so too could aggressive preventive measures to assure health and wellness make a difference in this century. 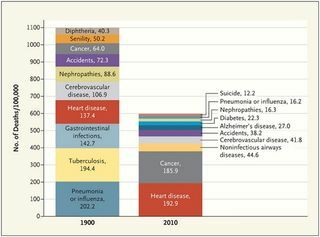 What is evident is that the causes of death have switched from acute illnesses to chronic illnesses. And we know from insurance companies that chronic illnesses consume about 70-85% of claims paid. What is less well appreciated is that our medical care delivery system was established over the years to deal with acute illness and for one provider to care for one patient. In this regard, think of the internist who treats a pneumonia with an antibiotic or the surgeon who cures a patient by removing the appendix. But patients with complex chronic illnesses need not one doctor but a multi-specialist team to give the best possible care. And the team needs to be well coordinated, probably by the primary care physician or in the case of some situations by a specialist. In both circumstances the coordinator directs - orchestrates - the entire team to offer the patient the highest quality at the least expense. This is a change in how care is delivered that needs to fully occur as illnesses have increasingly become chronic, complex, life long, difficult to manage and expensive to treat. 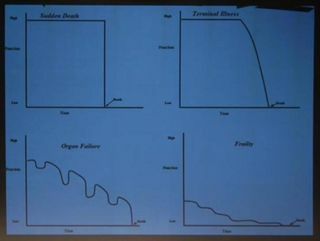 This TEDx talk by Peter Saul summarizes the four ways we die out in plain, if uncomfortable detail. I may change my mind, but given a choice I would choose #1 or #2. Option #3 can be manageable in many cases but #4 definitely is the worst. Living longer doesn't mean a longer youth. Longevity means a longer old age. Not so sure--seems as if frailty can in some cases be addressed with Ensure nutritional products and calcium treatments, cardio-rehab, weight training. I have seen it in elderly relatives now thriving. Even a pill derived from ingredients in tea can slow the decline of COPD--it is called Theophylline. And I am amazed how young active many retirees look. Thanks for your comment. Good points. And what you say is correct, but it underscores the main point -- when protracted "frailty" is the pathway to the end the decline is extended. But at the end, regardless of the ultimate cause, the proximate cause will still have been frailty (as opposed to the other three categories). It's important not to conflate quality of life with cause of death. Although most candidates still don't take advantage of it, palliative care provides an excellent quality of life to the end. Likewise, frailty need not imply suffering or incapacity, only the famous traits of aging sans teeth, sans eyes, sans taste, sans everything. I have worked around several centenarians and have been amazed how little they looked "that" old, whatever that is. Take a look at How Doctors Die from a few days ago. And check the link to the video "Jim Cooper's Story." This post is aimed more at getting people to think about the subject than making limited categories.